Plasma cutting is achieved by using a plasma torch to cut conductive materials. These high-speed cuts are cost-effective allowing us to keep our projects both affordable and beautiful. Our Computer Numerical Control, or CNC, cutters allow for the production of 2-dimensional and 3-dimensional cuts as well as tube and section cutting. 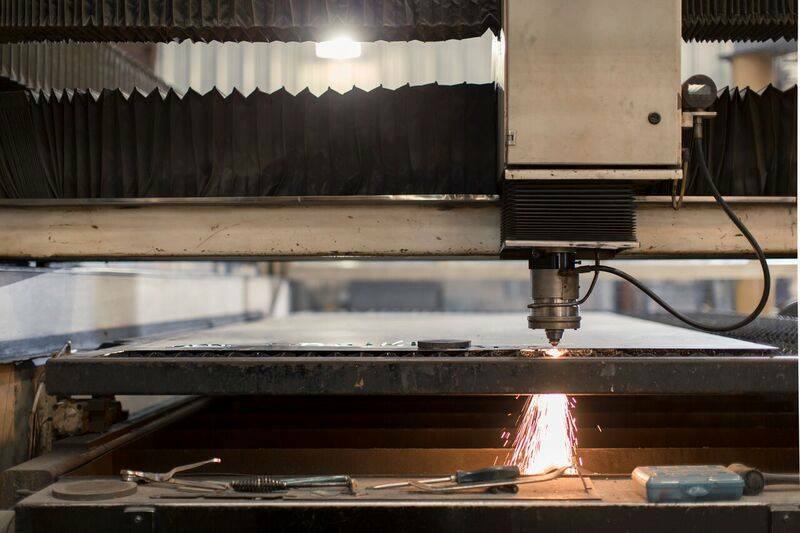 Similar to plasma cutting, laser cutting uses high-powered lasers to produce smooth cuts. Using CNC, we can use laser cutters to precisely and easily engrave, bore, or cut a variety of materials. This type of cutting allows for the intricately detailed cuts we use to produce many of our personalized projects. In addition to our Plasma and Laser cutters, we also have a large metal shear and a variety of types of metal saws for basic cuts. Abrasive cutting is the basic method of cutting using an abrasive saw with a circular abrasive blade or resin-coated composition wheel. Band sawing is another common method of cutting that we use to cut rod, bar, pipe, and tubing. These saws come in a variety of tooth configurations and can cut a variety of shapes like rectangles and channels. Both types of saws are inexpensive for our customers and are a quick method of cutting.